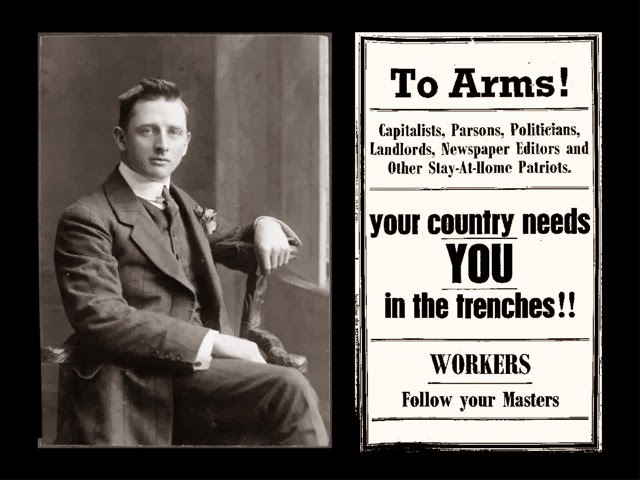 After emigrating to New Zealand and joining the IWW, Tom Barker became an organiser for the syndicalist union, he organised the Auckland general strike of 1913 which led to him being forced to move to Sydney, Australia where he becamse editor of the IWW's Direct Action. He was deported to Chile in 1918 and then travelled the world organising workers, before returning to the UK in 1927. Tom Barker became the editor of the Australian IWW's Direct Action in 1915 after Tom Glynn was arrested in 1915. He supported industrial unionism because of the failure of Labourism. "I was absolutely convinced after seeing politicians in both New Zealand and Australia that a strong and even ruthless working-class body was necessary to see that people were properly protected and paid." Tom Glynn and Tom Barker brought an infusion of Marxist perspective to the Australian Socialist Party and the IWW Clubs when they joined in 1913. All governments in modern society, Barker argued, existed for the purpose of protecting private property and the interests of the propertied class; whether the politicians were socialists or conservatives, they could only safeguard and perpetuate the system of oppression. Barker attacked the Second International for being spineless. "Let us get to work, we of the Industrial Workers of the World, we, the countryless, the pariahs, the hobos, the migratory workers. Let us throw off the pusillanimity of political sentimentalists. Economic conditions are bringing us together in spite of ourselves and we, the workers of the world, are dependent upon one another. Born in Westmoreland, England in 1887 of Lakeland farming stock; he worked as a farmer at age 11 and then at a milkhouse at age 14. In 1905 he joined the army at age 18 and became a member of the cavalry. He left the army, at the rank of lance corporal, when he began suffering from heart problems. He worked on the Liverpool railways till emigrating to New Zealand in 1909. He got a job as a conductor for the Auckland tramway. During 1911 to 1913 he was the branch secretary of the New Zealand Socialist Party's Auckland Local. After being laid off in 1913 he began organizing for the IWW and led the Auckland General Strike of 1913. He was imprisoned in Wellington during the winter of 1913 and charged with 3 counts of sedition. He was released in the winter of 1914 under a bond of 1500 pounds, at which time he emigrated to Sydney, Australia. In 1915 Baker railed against the Australian Workers Union for refusing to organize coloured workers, even after a series of strikes in which the coloured workers refused to scab against the AWU. "The Class War is a nobler sentiment than the Race War, for it strives for the abolition of chains and not for their perpetuation." Coloureds and immigrants were an economic factor and it would be better if they organized with white workers instead of against them. When Edith Cavell was murdered by the Germans, Barker was disgusted by the ensuing outcry. "It ill becomes the capitalist press of Australia to howl about the murder of one Englishwoman, when it consistently stood for the exploitation of little girls, who have been taken from the playground, and pushed into the unhealthy and dangerous atmosphere of the factories; working for wages that are not sufficient to house and feed them." He believed feminists to be misguided. The women's suffrage had not secured equal pay for equal work. He believed women should be fighting with the men of their class and not against them. He also blamed capitalism for prostitution. "When wandering the streets of Sydney one sees the ever-growing army of the night, with its sweet recruits, and its battered veterans, you can see the gripping hand of commercialism and low wages." Under the administration of General Secretary Treasurer Barker no office holder was allowed cast a tie-breaking vote. Motions were accepted only if passed by the clear majority and in case of ties the motion lapse to insure fairness and true democracy. When the Labour government began arresting Wobblies for selling anti- conscription literature in Sydney's Domain, Baker spent a week in jail rather than pay the 10 schilling fine. Barker threaten to summon 10,000 unemployed men to the Domain if IWW persecution did not cease. During a meeting of the Political Labour League, Wobblies trapped Labour representatives in the room. They barricaded the doors after cutting the lights. The representatives where rescued by police after breaking a number of windows and shortly afterwards the prohibition of selling literature was lifted. After the conscription issue was defeated in referendum, Barker claimed the IWW through its speaking tours of Sydney and wide circulation of literature had swayed public opinion. Barker detested state-ownership of industries and fought for worker- controlled industry. "After the capitalist turns his profitless industry over to the state, his interest comes in regularly year by year, and he is save the worry of managing the industry and trying to calm the waters of industrial discontent. It is no consolation to the worker to know that the state exploits him now, in place of his capitalist employer. There is no hope for the working-class in state ownership. let us organize to control society by organizing to control the job. We who would be free ourselves must strike the first blow." Barker sent out the call for Wobblies to send donations to support the 1916 wildcat strike by shearers. He also went on a speaking tour to raise funds for the miners' strike at Broken Hill which was for shorter hours and better pay. In 1916 Barker cautioned Australian workers against jingoism and said they have no quarrel with German, Austrian, and Turkish workers. "Let those who own Australia do the fighting. Put the wealthiest in the front ranks, the middle class next, and follow them with the politicians, lawyers, and ministers. Answer the declaration of war with call for a general strike." The IWW seized the opportunity to increase agitation after the Second International and the political socialists failed to prevent the war. He was imprisoned after creating and distributing posters such as the one, left. He was released after winning his appeal on a technicality. He was later imprisoned on the same charge after distributing posters with a cartoon of a business man getting fat from the blood of a conscripted worker. After being released he joined in the fight with the coalition of anti-conscription forces which included the IWW, the Anti- Militarist League, Labour Party dissenters, various rival socialist parties, and the Catholic Church. Barker organized the protest of the imprisonment of the Sydney Fifteen - fifteen prominent members of the IWW imprisoned on charges of sedition after mysterious cases of arson in Sydney and the counterfeiting scheme by a couple of rogue Wobblies. He got numerous groups from across the globe to send letters of protest including the National Union of Police and Prison Officers in Britain. In 1918 he was deported to Chile and then expelled to Argentina where he worked the wharves of Buenos Aires, becoming active in the Marine Transport Workers Union. In 1920 represented the Argentinean Labour Federation at the Marine Transport Workers Union Conference in Oslo and attended the Syndicalist Conference in Berlin, where he denounced the dictatorship of the proletariat as inherently bad. In 1921 he attended the RILU conference as an Argentinean delegate. He wrote to Tom Glynn in prison that politicians will have no place in Russia - Lenin has denounced them. He worked with Big Bill Haywood on the Autonomous Industrial Colony Kuzbas, which sought to utilize foreign expertise to bring heavy industry to Siberia. He never joined the Communist Party of Russia because it conflicted with his IWW ideals. When the matter was brought to Lenin and Trotsky both men support him. In 1926 he and his wife Berta Isaakovna went to NYC to recruit American technicians and engineers. In 1927 he returned unimpressed and disenfranchised; later returning to England. He worked as a clerk with the London Electricity Board. He became a Labour member of the St Pancras Council in 1949 to 1959. When the Tory government was set on raising tenants rents he refused to operate civil defence arrangements, insisted on a closed shop for council employees, and flew the red flag each May Day. He took care of his wife who was blinded in 1950 and became a Camden councillor in 1960. He died in 1970 at the age of 83. A short biography of Spanish anarcho-syndicalist and anti-fascist guerilla fighter Basiliso Serrano Valero, a.k.a El Manco de La Pesquera.